On Valentines Day some women get chocolate or flowers but Rob surprised me with a dinner of Dungeness crab. Now… that doesn’t mean we went out for dinner, but he delivered six crabs in the form of “live” in a bucket. Rob is friendly with the people that run the crab catching business in Sooke and he did them a favour the other day. The next day they showed up with the crab. After presenting me with the crabs, we decided that we couldn’t possibly eat six so we gave two away and he left me holding the crabs so to speak. The good news is that I’m not squeamish about cleaning crabs as I’ve done it hundreds of times. But… I did go online to see if Google had anything new to say about humanity putting them out of their misery. It was an interesting exercise as I found out there is a lot of animal rights groups sounding off on this topic. Especially if you cook the crab or lobster while they are alive. This is actually something that the Swiss have banned. What I found was that I have been doing it right all these years. First, you take the crab out of the bucket and lay it on it’s back. Then taking a knife you insert it right at the top of the apron (little triangle of shell) as that is where the nerve centre is. In videos, it shows just putting your knife down through the little hole under the apron, but what I prefer to do is to put the knife in and slice down towards the back basically cutting the apron in half. This has the immediate effect of the demise of the crab and there is no struggle or movement. 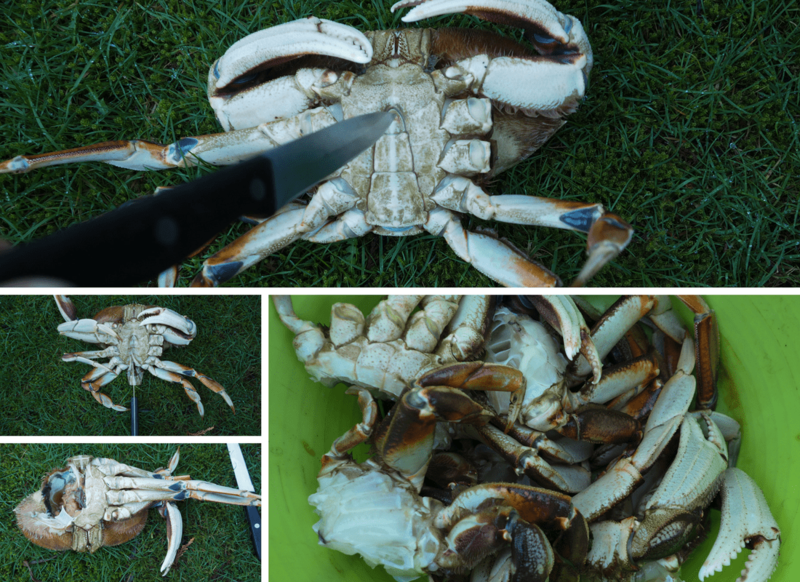 Once that is done, I pick up the crab, hold onto the legs and twist if from the upper shell. This removes the legs and meat from the internal organs. Then all you need to do is to clean up any lungs or organs left on the body and it’s ready for the pot. I have always boiled the crab in salted water, but I saw a recommendation to actually steam them instead. The premise was the crabs were more flavourful and didn’t get watery from sitting in the (you guessed it) water. Getting out my handy dandy steamer I put a little water in the bottom and steamed the legs for 12 minutes. Meanwhile, setting the table I got out all the crab accessories and started the garlic butter. Garlic from last years garden. 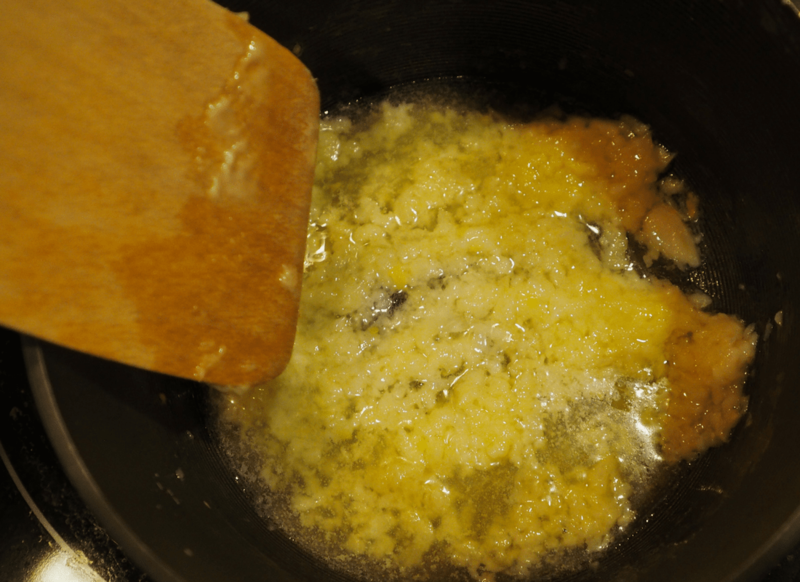 Two cloves sauteed, then add in rest of butter. 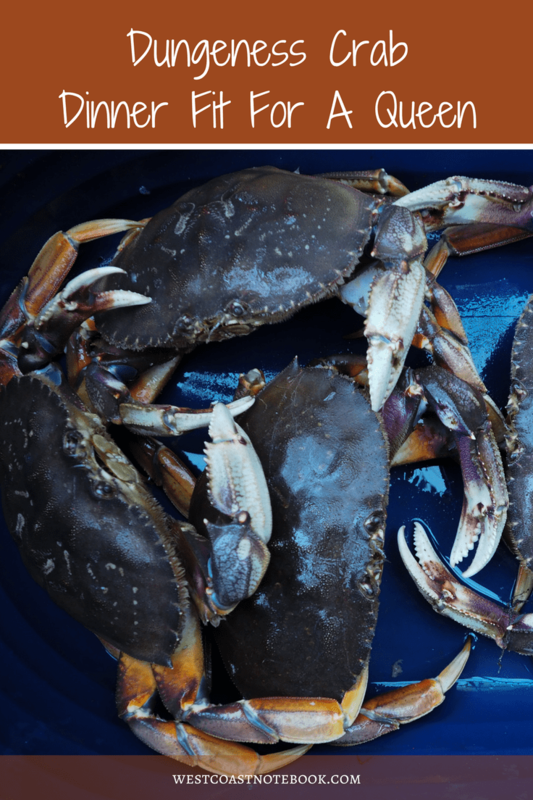 Simmer while the crabs are cooking and then pour the clear liquid off to dip your crabs in. and a plate in the middle to put all your shells. And that was it. That was dinner. No salad, no veggies, nothing. Just a big old crab fest. 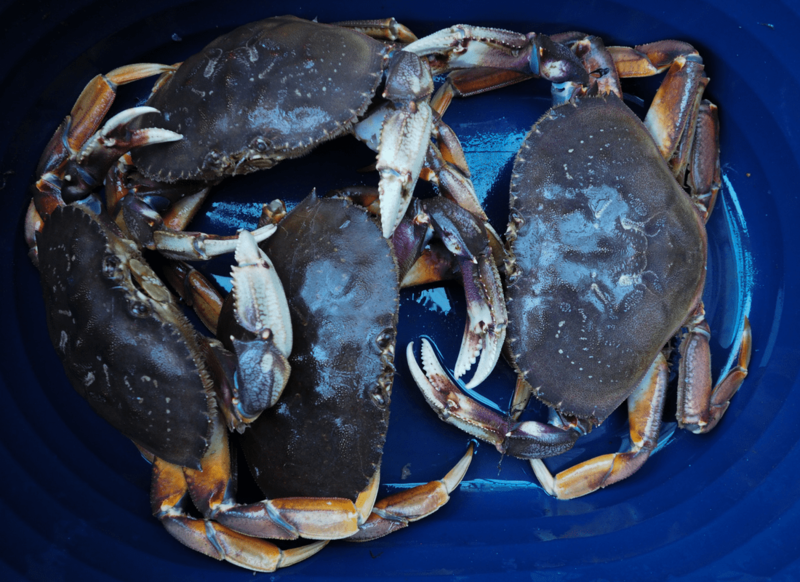 Steaming is definitely the way to go with crabs and I would do them that way again. Not only was it easier as you didn’t need to fill up a large pot with water, but there was less smell and I cooked them right in the house when normally I would do them outside. We ate until we couldn’t eat anymore and it was delicious. It was the best Valentines Day present of all.